Longboarding Blog: The Homemade Holiday Greeting Card Contest Has Arrived! The Homemade Holiday Greeting Card Contest Has Arrived! The contest you've all been waiting is finally here! The Homemade Holiday Greeting Card Contest begins today! Anyone and everyone willing to mail in their entry may enter this contest. (Yes, international entries will be accepted, but for the Grand Prize ONLY.) One entry per person. MAIL us your best Homemade Holiday/ Winter/ Christmas/ Hanukkah/ Kwanzaa/ Chrismukkah/ Wintersday/ etc. greeting card! 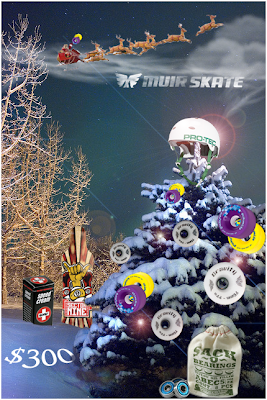 INCLUDE with your card a Longboarding Wish-List containing up to $300 worth of goodies (anything you can find on MuirSkate.com) for us to send to you if your card is selected as the Grand Prize winner. Entries must be received no later than midnight on December 15th. This will allow time for us to sort through and proceed to the next step in a timely manner. We will officially announce the winner once we've finished our egg nog on the evening of December 24th. Our ten favorite Holiday Greeting Cards will be posted to a dedicated photo album on our Facebook Page as quickly as we can get them up after the submission deadline (see above). The Muir Skate longboarding community members will decide who wins each prize by "liking" their favorite submission(s). can it be any size? Damn, looks like all you other anonymouses have it in the bag already. ahhh please extend the deadline one day?>?